There are many elements to understanding the complexities of time and effort reporting and how it impacts institutions of higher education (IHEs). Compensation for employee services is vital to most grants. Personnel and fringe benefits combined often represent a large share of the direct costs of every grant budget, so the documentation associated with it is of critical importance. IHEs generally have a large staff, often spread out among multiple locations, and ensuring that time and effort documentation is maintained for employees can prove especially challenging. As a result, many colleges and universities, in their single audits or audits from agency offices of the inspector general, have experienced questioned or disallowed costs stemming from the absence of documentation or the inadequacy of existing information. 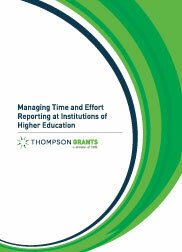 This whitepaper, brought to you by the experts at Thompson Grants was prepared specifically for the IHE community, and will address the key requirements, allowed activities and best practices for documentation recommendations for time and effort reporting under the Office of Management and Budget's (OMB) uniform guidance.